New research has shown the new evidence that dinosaurs ( ancient creature ) were warm blooded like birds and mammals. It was believed that they are cold blooded like reptiles but this was completely wrong. This is revealed in a paper published in PLOs ONE, by professor Seymour of the university's school of earth and environmental science. it was disagreed that cold blooded dinosaurs are weak than others and (would not have had the required muscular power to prey on other animals) and dominate over mammals as they did due the end the whole Mesozoic period. He says" we can learn much from the remains ( fossils ) of the dinosaurs but the one thing become very irritating among scientists that they cannot verify that they are either cold blooded or warm blooded." Crocodiles can keep their blood warm by basking itself in the sun, its body temperature rise above 30 degrees and simply it can keep its temp high at night by being large and slow to change in temperature. Like these crocodiles large cold blooded dinosaurs could have done the same thing and enjoyed a warm blood temperature. they can generate heat in their body by simply burning food energy like warm blooded animals .He also revealed that the muscle power produced by mammal type dinosaurs is about the same amount as compared to the crocodile type dinosaur. Dinosaurs dominated over the race of mammals in terrestrial ecosystem over the whole Mesozoic. in order to do so they must be stonger than other creature and had greater muscular power and great staying power. 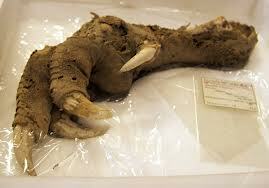 Megalapteryx foot preserved in NATURAL HISTORY MUSEUM.